Sea otters (Enhydra lutris) are an apex predator of the nearshore marine ecosystem – the narrow band between terrestrial and oceanic habitat. During the commercial maritime fur trade in the 18th and 19th centuries, sea otters were nearly hunted to extinction across their range in the North Pacific Ocean. By 1911, only a handful of small isolated populations remained. Sea otters resting in Glacier Bay National Park. © Jamie Womble, NPS. USFWS Permit #14762C-0, NPS Permit #GLBA-2016- SCI-0022. But sea otter populations have recovered in many areas due to a few changes. The International Fur Seal Treaty in 1911 and the Marine Mammal Protection Act (1972) protected sea otters from most human harvest. Wildlife agencies helped sea otter colonisation by transferring them to unoccupied areas. Eventually, sea otters began to increase in abundance and distribution, and they made their way to Glacier Bay, a tidewater glacier fjord and National Park in southeastern Alaska. 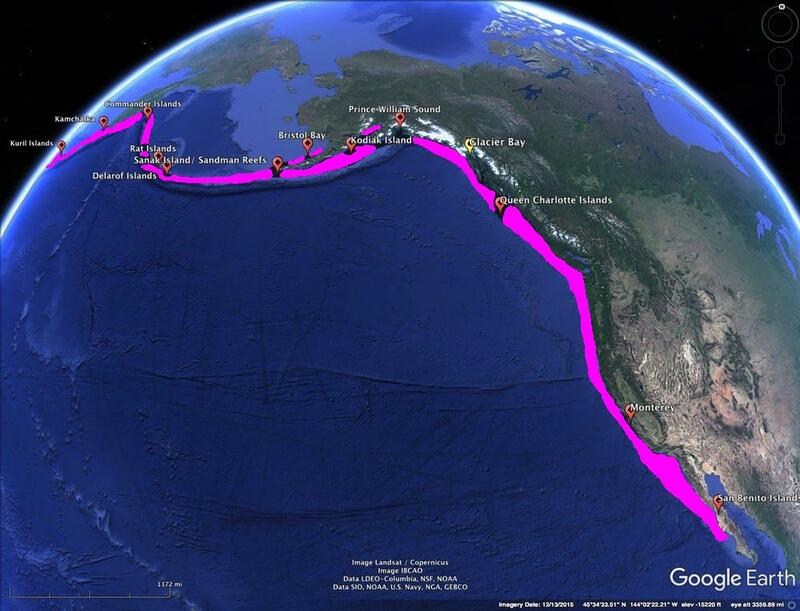 Historic range (pink shading) and 1911 remnant populations (red icons) of sea otters. Glacier Bay is functionally one of the largest marine protected areas in the northern hemisphere. It was completely covered by glacier ice until approximately 1750 – about the same time sea otters disappeared from the surrounding area due to the commercial fur harvest. After 1750, Glacier Bay endured the most rapid and extensive tidewater glacier retreat in recorded history. After this retreat, a rich environment emerged. This new environment supported high concentrations of wildlife, including sea otter prey species – such as crabs, mollusks and sea urchins – that were able to increase in size and abundance without one of their natural predators. In recent history, sea otters first appeared at the mouth of Glacier Bay around 1988 and found a large, ideal habitat and lots of prey populations. Twenty years after sea otters were first observed colonising Glacier Bay, they became one of the most abundant and widely distributed marine mammals in the bay. Sea otters are a keystone apex predator that can dramatically alter the marine food web. One of the best-known, and most studied examples of food web change is the interaction among sea otters, sea urchins and kelp forests. Sea urchins feed on kelp and, if unregulated, can completely consume kelp forests. The loss of kelp forests can harm other marine species that rely on the kelp. When sea otters are present, they regulate sea urchin abundance, preventing kelp deforestation. Due to their role as a keystone predator, the US National Park Service – Inventory and Monitoring Program recently identified sea otters as a candidate for Vital Sign Monitoring. Vital-sign monitoring is used to track specific ecosystem processes that are selected to “represent the overall health or condition of park resources, known or hypothesized effects of stressors, or elements that have important human values” (taken from the Goals for Vital Signs Monitoring on the National Park Service website). Monitoring the abundance and distribution of sea otters will provide necessary information to the National Park Service for understanding sea otter colonization of Glacier Bay and their impacts on the nearshore marine food web. Sea otters colonising new parts of Glacier Bay each year, meaning that the survey design needs to be repeatedly updated to address the expanding population, while remaining financially feasible. Aerial photography has proven useful for efficiently monitoring other marine species, such as harbor seals. 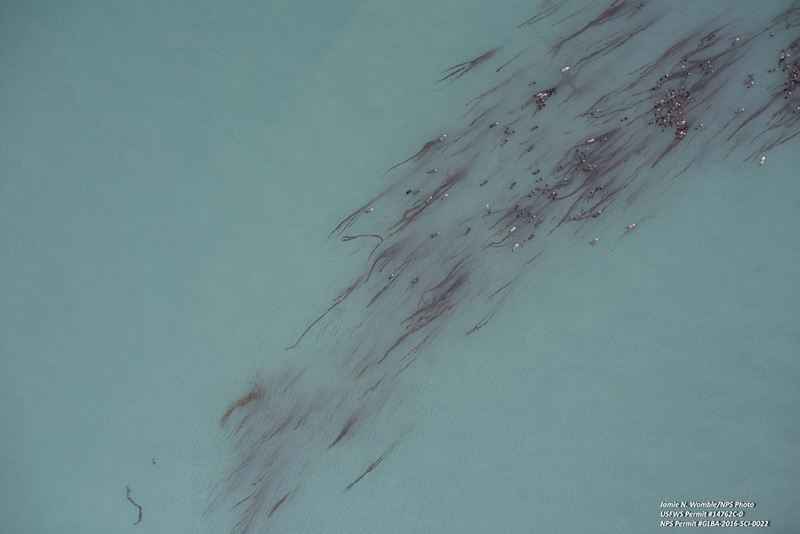 We recently developed a framework for using aerial photographs to estimate occupancy and abundance using aerial images with imperfect detection and applied it to survey sea otters in Glacier Bay. Aerial photograph of sea otters in Glacier Bay (2017). © Jamie Womble, NPS. USFWS Permit #14762C-0, NPS Permit #GLBA-2016-SCI-0022. Aerial photographic surveys are more efficient than traditional survey methods because they can cover more area using more direct flight routes. The improved efficiency increases personnel safety and decreases cost. Also, photographs provide a permanent record of the data for future reference that can be independently verified and also allow for the quantification of habitat covariates, such as kelp. Our framework lets you estimate occupancy, abundance and detection probability at the same time using a hierarchical Bayesian model. In this model, multiple photographs are taken of groups of otters, providing temporal replication of the counts. The temporal replication provides the necessary information to estimate the probability of detecting an individual otter within a photograph, without relying on ancillary data. Our survey design uses aerial photographs with manned aircrafts, but it could easily be transferred to unmanned aircraft systems, as regulations and technology permit. 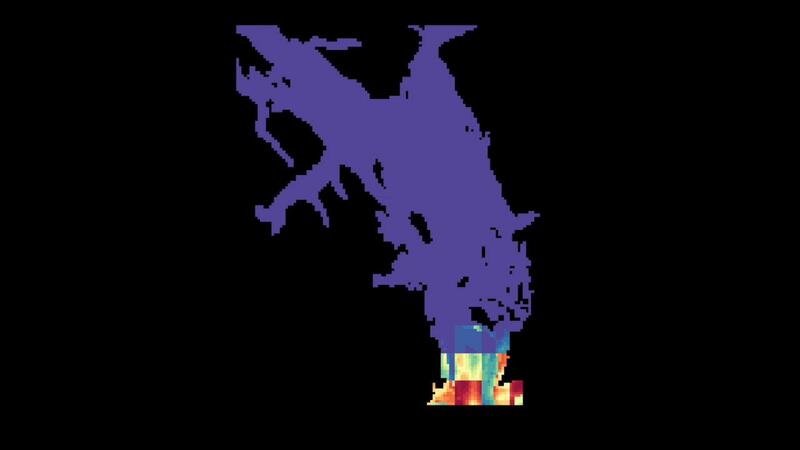 To address the sampling challenge associated with sea otters colonising new areas of Glacier Bay, we developed a dynamic spatio-temporal statistical model to forecast the movement of sea otters across Glacier Bay. To build this model, we first developed a mathematical process model using partial differential equations to describe the growth and spread of sea otters. Partial differential equations are commonly used to describe phenomena such as fluid dynamics and quantum mechanics. So they’re a natural choice to describe how mass – in our case, the sea otter population – spreads through space and time. We incorporated our current understanding of sea otter ecology and behavior – including habitat preferences, maximum growth rates, and where sea otters were first observed in Glacier Bay – into the mathematical model. Estimated sea otter distribution in Glacier Bay from 1993-2016. Next, we incorporated our partial differential equation in a hierarchical statistical model. Hierarchical models are used to draw conclusions from data that arise from complex processes. They provide flexibility to describe and distinguish among various sources of uncertainty, such as uncertainty in data collection and ecological processes. By fusing partial differential equations with formal statistical models, we can reliably infer and predict dynamic ecological processes, while appropriately quantifying the uncertainty associated with our predictions. Data are usually collected independently of the models that will be fit to them. Also, they’re rarely sampled at spatial or temporal locations that are optimal for the analysis of a specific scientific investigation. So the location and timing of data may have very little to do with the underlying scientific mechanisms. When sampling designs are developed independently of modeling (ignoring the ecological dynamics we often seek to capture in our models), they can be inefficient and fail to capture essential spatial, temporal, or spatio-temporal variability of an ecological process. All of these are critical in wildlife research and management. When financial resources limit the effort that can be devoted to collecting data, classical design-based inference may result in estimates that aren’t precise enough for management or conservation. Optimal dynamic survey designs let you extract the most information from the data that can be affordably collected, helping to improve our understanding of the ecological system despite limited or shrinking financial resources. Using the statistical forecast from our model, we developed a framework to monitor the dynamic spatio-temporal colonization of sea otters optimally. Optimal monitoring can increase sampling efficiency in estimating the distribution and abundance of a target species by focusing efforts in areas that contain a lot of uncertainty in our forecast, while limiting efforts in areas that we know more about. As more surveys are conducted, additional data are gathered; the additional data allows you to evaluate your model predictions, and refine predictions of distribution and abundance through time. The combination of modern statistical techniques and survey data based on aerial photographic methods provides a cohesive scientific framework for learning about sea otter ecology and colonisation dynamics, and designing efficient monitoring protocols while maximizing safety and minimizing cost. The modeling and monitoring methods described here were first implemented in Glacier Bay in 2017. They will continue to be used to study sea otter ecology and for long-term vital sign monitoring in Glacier Bay National Park. To find out more read our Methods in Ecology and Evolution article ‘Estimating occupancy and abundance using aerial images with imperfect detection’. This entry was posted in Conservation and management, Methods papers, Statistical methods and tagged Abundance, Aerial Photography, Apex Predator, Distribution, Dynamic Spatio-Temporal Models, Food webs, Glacier Bay, Hierarchical Bayesian Model, monitoring, Nearshore Marine Food Web, Partial Differential Equation, Sea Otter, Vital Sign Monitoring, Wildlife Management by Chris Grieves. Bookmark the permalink.